We are offering Castor Oil at very competitive prices. Our Castor Oil is formulated using high grade ingredients in accurate amounts. 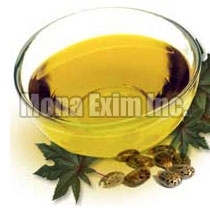 Possessing exceptional chemical properties, the Castor Oil is used in adhesives, brake fluids, caulks, humectants, dyes, inks, lacquers and many others. It is widely acclaimed for its high efficacy and purity. Our Castor Oil is hygienically packed in premium grade packaging material to ensure long shelf life.